In its early days the Happy Valley School in Ojai, California founded by the Indian philosopher and teacher Jiddu Krishnamurti was supported by the southern California creative community which included Arnold Schoenberg and the pianist Lili Kraus. Igor Stravinsky was a close friend of Krishnamurti, as was Pau Casals who played for him in Rome in 1963, while Ravi Shankar and Alla Rakha performed at a talk by Krishnamurti at Brockwood, England in 1975. Krishnamurti certainly moved in exalted music circles; however his teachings are expressed in acerbic prose and are therefore unsuitable for conventional music settings. So as conjunctions of Krishnamurti and music are now rarer than the proverbial hens teeth, an album with a track titled Tales of Krishnamurti is certain to grab my attention. Maqâm Roads is a new release from Zied Zouari (violin, alto sax), Julien Tekeyan (drums, Armenian percussion,), and Abdurrahman Tarikci (bass, vocals) who are seen above. 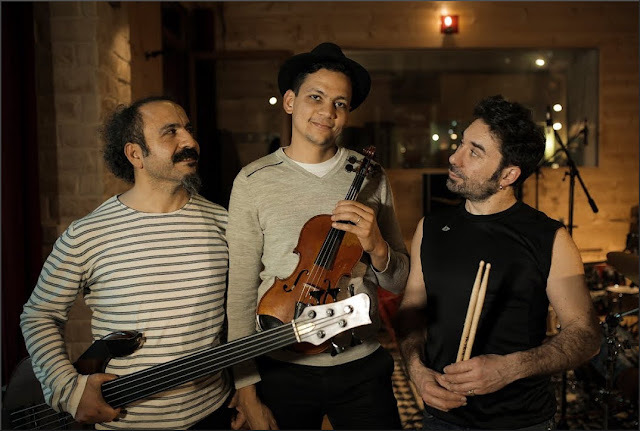 In his sleeve note Tunisian violinist Zied Zouari explains that the instrumental Tales of Krishnamurti, which has its musical centre of gravity somewhere between India and Tunisia, was inspired by Krishnamurti's book The Kingdom of Happiness. Krishnamrti taught that: "Leaders destroy the followers and followers destroy the leaders. You have to be your own teacher and your own disciple. You have to question everything that man has accepted as valuable, as necessary”, and Maqâm Roads is another notable world music release that eloquently questions everything a risk averse music industry insists is valuable. Maqâm Roads comes from Accords Croisés, an independent French hybrid that brings artist management, concert promotion and record label under one roof with the the laudable mission of "giving the music back to the artists and to their public".View a taster video of the album via this link and marvel at Krishnamurti's acerbic prose and astonishing 1981 premonition of the perils of social media in the video below. No review materials used in this post. Any copyrighted material is included as "fair use" for critical analysis only, and will be removed at the request of copyright owner(s). Also on Facebook and Twitter.